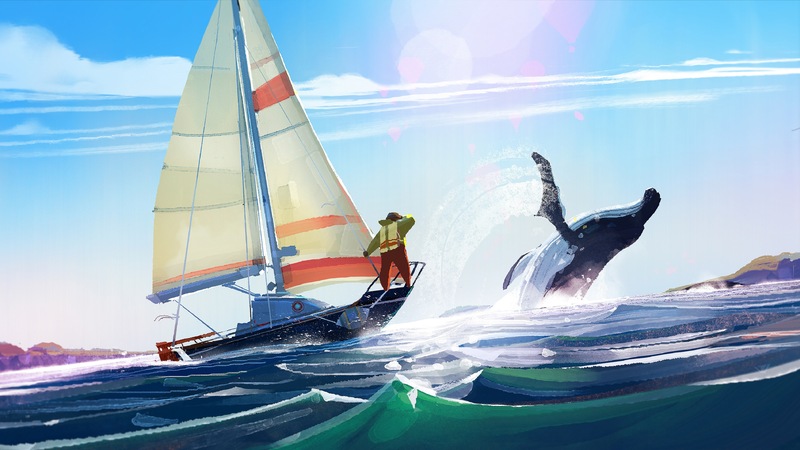 It’s been on our radars for about a year, and Old Man’s Journey ($4.99) is out now and well worth checking out. This adventure game is the tale of an old man who goes on a journey that touches on his past and is at times a harrowing tale of survival in a world where there just isn’t that much transportation infrastructure. I’m joking around, but that is solely to cover up that Old Man’s Journey is an emotionally effecting experience that is brief but well worth experiencing. The artwork is gorgeous, with this hand-painted look combined with some clever visual effects to make the world feel alive. Looking at the behind-the-scenes artwork is quite recommended, just to see how far the game has come along, and to see the genesis for the splendor you are to experience. 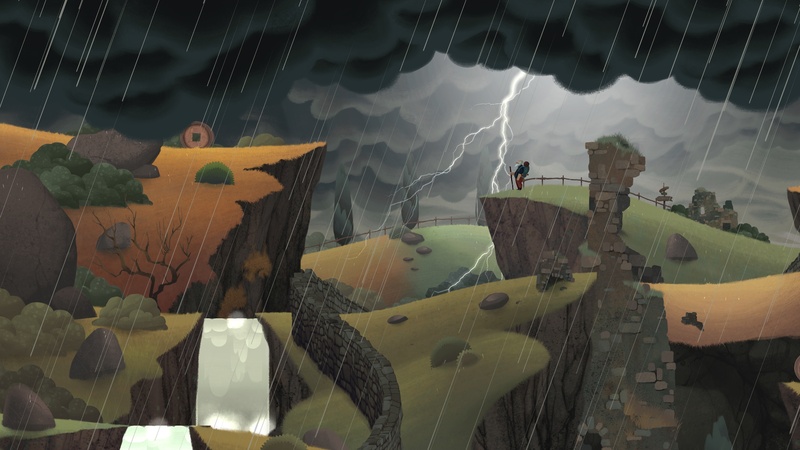 The story of Old Man’s Journey is told without any kind of dialogue, and all through actions and flashbacks. Who the eponymous old man is, his journey, and what his past is are revealed through flashbacks and what you do in the game. The narrative isn’t much for irony: the bright moments in the game correspond to happy memories, and the dark moments to struggle and hardship. You have to play this game with the sound on, as it plays a significant role in creating the emotional world of Old Man’s Journey. I’m not ashamed to admit that the game made me cry at the end; the whole thing has some elements that relate to me and where I am in my life right now and what’s happened in the past year. I just wish I hadn’t made the mistake of finishing the game up while sitting in a Starbucks. Of all the poor life choices I have made, having to wipe tears from my eyes in the corner of a late-night Starbucks is up there. Just the way the game looked was part of Old Man Journey’s initial appeal, but after playing this, the story lives up to what the visuals promised. 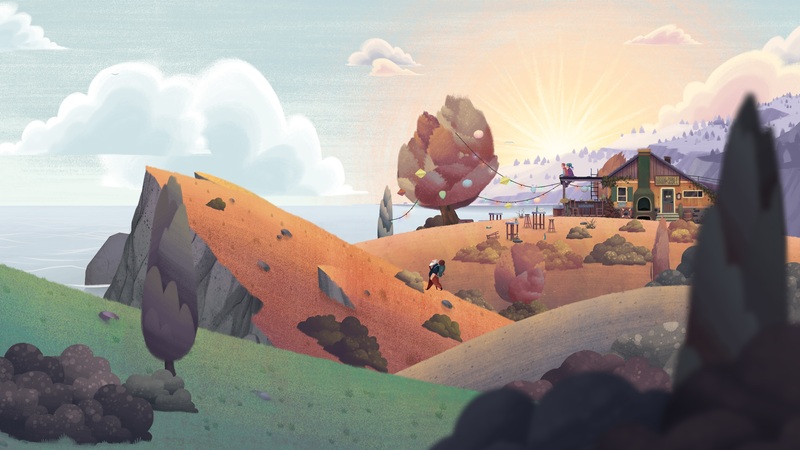 Old Man’s Journey is primarily about the adventure that you’re going on, and there’s nothing in the way of “combine this item with another," and limited interaction with characters at all, but there are some light puzzles to be solved. Primarily, this comes in manipulating the land so that you can walk around the map. You’ll see where various points of the land connect as you walk around, while being unable to manipulate the land you’re on, and you try to make it to the next area. You also have to engage in some makeshift sheep-herding, as you tap sheep to move them from one patch of grass to another so that you can get past them without issue. That’s pretty much it; there’s not anything that will leave you particularly bewildered. The puzzles are there to provide just a light bit of resistance, to make the game not just a straight-through romp. There’s another interesting interaction, and it is sliding down waterfalls. The Old Man is a quite the resilient senior citizen, as he can fall down a waterfall and not suffer any harm. It’s certainly a unique way to navigate the world, because this sort of thing would feel like a fail state, but instead it’s a way for the ole geezer to get around in some scenarios. Don’t worry, it’s not possible to get stuck if you go down a waterfall that you didn’t expect. There’s no fail state in the game at all – I might have gotten stuck with some sheep once, but quitting and reopening the app solved that in a jiffy. The developers have made the interesting choice to enable ReplayKit in the game. Certainly, a screenshot-sharing utility, as is included, is a natural fit for this kind of game, where people should be sharing particularly gorgeous moments. But video seems like an interesting angle for a game like this feature. You could share interesting puzzle solutions, or poignant moments with others. While experiencing the story for yourself is the most important thing, I applaud the inclusion of video recording. When spoilerphobia runs rampant on social media, and games like Persona 5 see sharing restrictions, I’m glad to see one developer encourage video sharing. Though, the ReplayKit recording can be kind of buggy at times. To be fair, ReplayKit in general seems to be pretty unstable. The thought counts, though. Also, releasing on mobile and PC at the same time is similarly commended by me. This is a gorgeous experience, and while the intimacy of touch controls is a good thing for an emotional game like this, I also say let people enjoy it wherever they feel like doing so. Of course, your mileage will vary with how the story hits you, and whether there is enough ‘game’ here to satisfy you. It’s a game that will last you a couple of hours, and there’s not a whole lot in terms of replay value. If your gaming money is limited and and you need something with replayability, this isn’t the game for you (though hey, you could always buy this and sink some time into a free-to-play game). But considering the profound effect it had on me, and the beauty of the experience, I definitely recommend Old Man’s Journey, as it is quite the experience.